At Ceatus, our experienced team of 45+ professionals have one purpose: to take care of our clients. From our offices in sunny San Diego, we deliver the highest quality digital marketing strategies and best customer service in the industry. Our in-house SEO, Writing, Web Development, Client Services, Sales, Software Development, Operations and Marketing teams work synergistically to ensure all aspects of your Digital Marketing Strategy work together for your success. We continuously monitor the ever-changing Internet landscape and keep up with the latest developments by regularly attending local and national SEO, social media and other digital marketing conferences. Our expertise and extensive knowledge of the Internet industry allow us to devise inventive customized strategies for each client. When you contact Ceatus, either as a current client or a potential client investigating our services, you will speak with an experienced digital marketing professional whose sole objective is to provide our clients with the quality products and services they deserve. Your business success is our mission! 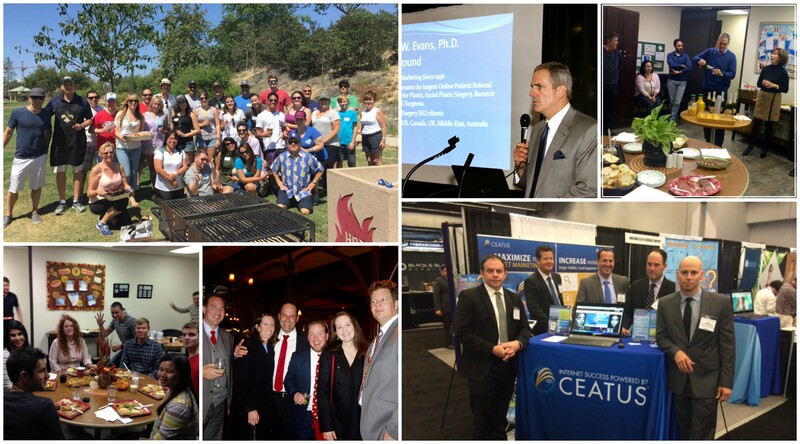 At Ceatus, we have the best and the brightest, so it’s no wonder we work hard and play hard together. Our casual parties in the break room, highly anticipated company picnics – the last one featured an authentic Louisiana shrimp boil – and our annual holiday extravaganza at the famous steakhouse, Lou and Mickey’s, offer frequent opportunities for fun and impromptu idea sharing. Our company culture encourages our employees to grow personally, professionally and as a team. Dr. Evans has directed marketing efforts for both medical companies and elective health care practices since 1985. In 1995 he began his career in Internet publishing and advertising. Since that time he has been actively involved in building Internet visibility and practice revenue for numerous surgical and dental practices, both in the United States and abroad. Dr Evans is a recognized authority on Internet-based medical marketing strategies. He has written numerous articles about the best practices in digital marketing and speaks widely at industry conferences, including American Society for Aesthetic Plastic Surgery, American Society of Plastic Surgeons, International Society of Refractive Surgery, European Society of Cataract and Refractive Surgery, Caribbean Eye Meeting, American Society of Cataract and Refractive Surgery, Greater New York Dental Meeting and American Academy of Cosmetic Dentistry. Dr. Evans is also the founder of VectorVision, which since 1987, has specialized in developing products for the standardization of contrast sensitivity, glare and ETDRS testing. He recently began publishing a blog about eye health and new advancements in treatment. Visit his blog on our website BetterVisionGuide.com.